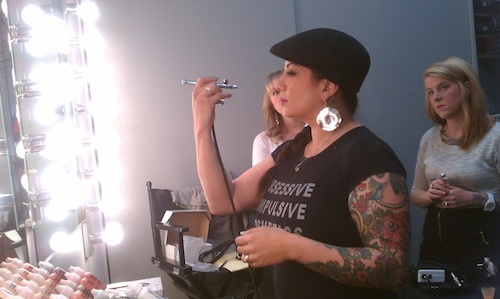 Valerie Hernandez demonstrates how to apply the OCC airbrush makeup. Earlier this morning I went to drop my mom off at the Bob Hope airport. It’s always fun when she comes to visit and I was sad to see her go. Since it was still rush hour, I decided to kill some time at Nigel’s Beauty Emporium in North Hollywood. They sell a wide variety of makeup, special effects, kit bags and other supplies for professional makeup artist and hair stylist. I love talking to the employees there because they are working makeup artist and very knowledgable on the product lines. Right when I was about to check out, I saw Valerie Hernandez, makeup artist to the stars. I had met her at a YoungBlood Cosmetics event I attended last year. We started talking and found out that she was teaching an airbrush class with Obsessive Compulsive Cosmetics (OCC) and it was starting in the new few minutes! I didn’t have an airbrush kit with me but Valerie was so nice and said I could use her airbrush setup. I had never tried OCC airbrush makeup before and I was dressed a bit like a bum, but I decided to throw caution to the wind and attend the class. It was a small intimate class of seven, which was great because it allowed us to ask a lot of questions and really learn about the product. All the other students had purchased the OCC portable airbrush kit at The Makeup Show that was held last weekend. Valerie did a demonstration, then we had a chance to practice applying the OCC airbrush foundation on each other. Everyone had a great time and I am so glad I stayed. I will write more about what I learned in a future blog.